I’ve tried to get married in my home state twice in the past year. 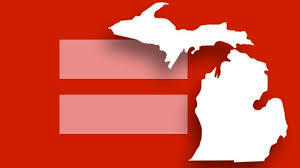 Clearly I do not live in one of the nineteen (and counting) states that offer gays the sanctity of marriage. My partner and I have been together ten years and have two young sons. While I would love to marry the woman of my dreams, I get super pissed off that our state constitution denies that we are a family and prevents our sons from having the protection of two legal parents. We are currently waiting to hear what the federal appeals court says regarding DeBoer vs. Snyder and hail to the moms who filed the lawsuit seeking to protect their family and young children! I wrote the following poem after our latest failed attempt to get married at the clerk’s office. We want what every other couple in America wants: the right to get married witnessed by friends and family in an overpriced banquet hall with a quasi-decent catered meal. Enjoy! Heat and clerks run overtime. For the next four hours only! Next to the store bought cake. Tie all the rainbow colors together. The line is too long for some. Breathy hope steams from them. Adrienne Losh is a poet/mother/wife/badass. She won’t stop standing in line for equal rights. The year was 2007. My first child had just been born. For the first time in my life I didn’t feel any pressure to figure out what I had to do next. I spent my days loving him, tending his needs, and I was happy. It wasn’t perfect or simple, mind you. New babies are scary. Plus we moved from Arkansas to Michigan right after our son was born, and that wasn’t easy for me, but I am extremely adaptable. Maybe I had the opposite of post partum depression. I remember talking happiness with my cousin Chris and telling him that true happiness was indeed contentment. This contentment lasted for probably about three or four months. I am so wise. My mom used to accuse me of wishing my life away. I’ve noticed my son does it, too. He told me lately he couldn’t wait to be big. I remember feeling that way. It makes me sad for him. Even at this stage in my life, I’m constantly pushing myself do more, look for something else, accomplish something, because honey, it ain’t enough like it is. I’m working on a writing project that keeps providing roadblocks. I take it as a sign that my skill is lacking, though overall it is a good piece of work. My confidence is on a precarious perch. I decided to start writing again during my brief spell of contentment. I decided it was a good time to give my life-long dream a try. Why not? Now as I bang my head repeatedly against the wall, I only wonder why. I’m pushing myself toward success and my goals aren’t realistic. But I wasted so much of my life afraid of failure. My worry is how my discontent and the pressure I put on myself affects my family. But if I don’t apply the pressure, who will? How do people find it within themselves to just be? I had it once, but it slipped away.